Session "Open, Digital Science - moving beyond open access" by Celina Ramjoué and Silvia Luber. The session was mainly group discussions; these are summarized in the Etherpad. The question of what policy actions are needed to support this new scientific ecosystem is an interesting one; it's a complex system and we are still figuring out necessary pieces. "Let's build the road network of civic technology." Google Docs URL for slides. "open data is hardly ever appropriately licensed"
Q: Andrew Clarke, Omidyar @andrew_c_clarke - What is the most needed (thing in this space)? "I am in a hurry"
Why should we be open? 1. transparency. Better information should lead to better decisions. 2. fairness. Give taxpayers back what they pay for. 3. innovation. The more you share, the more people have to build on. 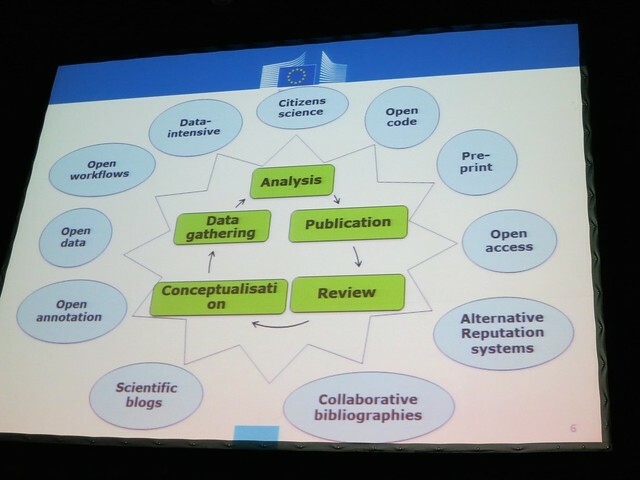 EU has delivered for open science. Open access can be good for citizens, good for scientists, and good for society. Horizon 2020 will offer 80 billion euros for research, and every resulting publication will be openly and [freely] available. Plus opening a lot more research data. TED Prize awarded to Charmian Gooch of Global Witness, "Global Campaign to Abolish Anonymous Companies"
Martin Tisné (@martintisne) asked at Open Knowledge Festival (#okfest) about success factors for open data initiatives (I'm paraphrasing the question). Scoping it to just open data is useful because we can talk about specific motivations and activities rather than the broader issue of open government. Many of the open data initiatives were, at least in part (and sometimes covertly) ways to drive a wedge of innovation into government (as well as a wedge of transparency). The motivators were to open government up to civil society, to open government up to modern technology approaches, and to unleash the creativity of civil servants who often don't have channels for their innovative ideas. Initially we thought just creating the portals and getting the data would be the hard part. So a lot of effort was put into just getting data up in any format, using manual processes, and leveraging whatever data was released using apps contests and hackathons. This almost turned out to be easier than expected - maybe we succeeded too quickly in a way. Now there is a struggle to define what a sustainable next generation open data initiative looks like, but confusingly this is happening at the same time as some countries are just embarking on their first open data steps. There may be no one path to success; ultimately the sustainable and impactful sites will be the result of an ongoing conversation between the data owners and the community of interested users. 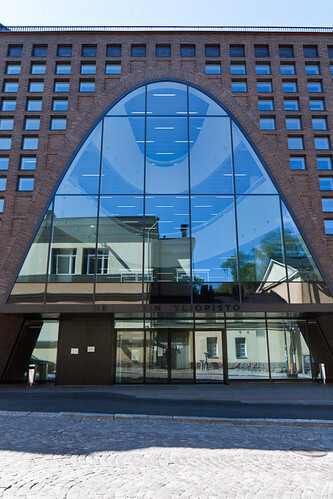 My tiny contribution to OKFestival is to arrange a small tour of the new Helsinki University City Centre Campus Library (Kaisa House, Main Library). The library just opened (September 2012). The tour is on Monday September 17 in the morning (before the main conference starts). Please contact me via email or Twitter if you'd like to join.